Drums SD - Drums for your iphone. 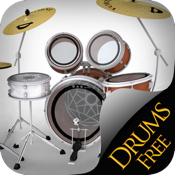 Drums SD is the best drums app for the iPhone, specially designed for children so they could play and learn music. With this app you can play on a very realistic drum kit, with 8 different sounds such as crash,kick,snare and more! In addition you can play a guitar in the background for playing with accompaniment. There is also a metronome so you could keep track on your music BPM. In addition there is a nice hand with stick animation so you'll feel like you are play for real. Also there are animated notes coming out of the drums kit parts. -HD sounds and SD images. -8 different drums tools - Snare,Crash,Hat and more! - Multi touch for two touches! so you would experience the real feeling (Playing with two hand). -24/7 support from our support team - you can easily send email through the info section.